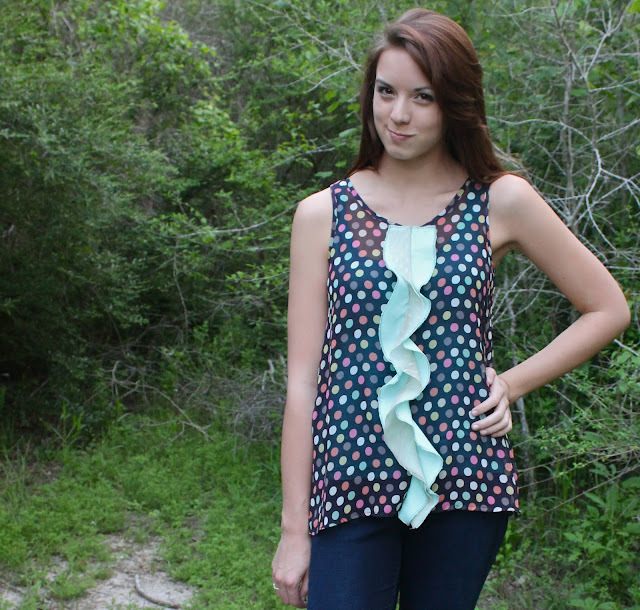 This is a re-post of a tutorial shared originally at See Kate Sew's Ruffle 2012 series. One of my favorite things to do is to buy discount clothing and jazz it up with my own handmade touch. 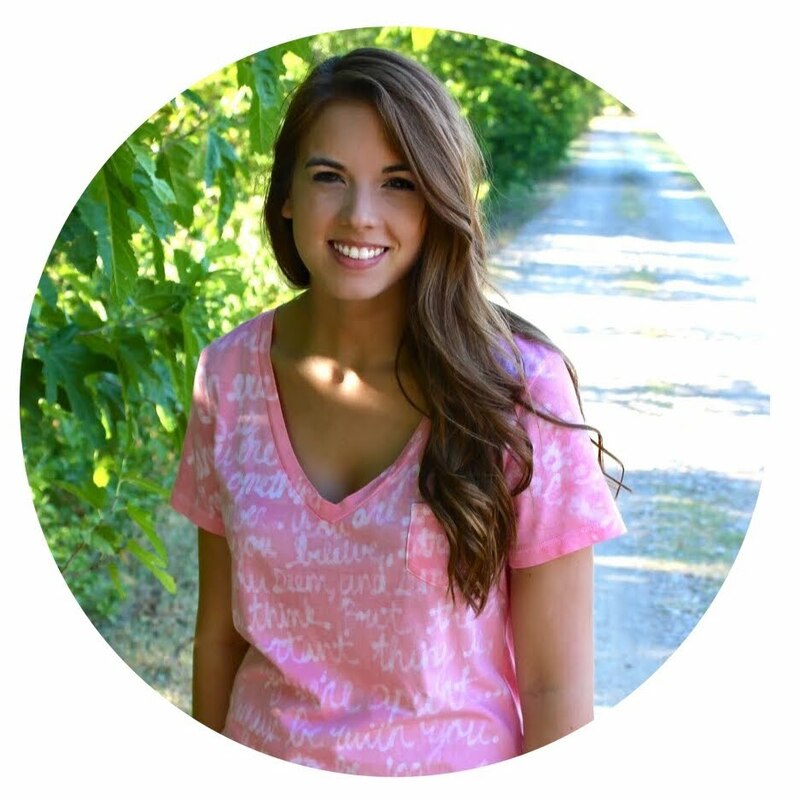 It makes sewing for yourself a little less daunting, more of a semi-homemade approach. I found this little top at Forever 21 for $15. It cost me maybe $2 and about an hour to personalize with a little ruffle. Store bought top, dress, skirt, etc. Measure the length of your top from the center of the collar to the center of the hem. Now I know that the diameter of the circle I need is about 6.5 inches. Search the house for some circular objects that you can use as a tracing tool. Pots and pans lids worked really well for me. Measure across the widest part of the circle to find a circle that has the diameter you need. This will circle will serve as the inner circle. Now that you've found your inner circle, you'll need to find a larger lid to serve as the outer circle. The outer circle should be about 4-5 inches wider than the inner circle. i.e. My inner circle's diameter was 6.5" so I found a lid with a diameter of 11" to serve as the outer circle. Trace your outer circle onto your material. And now the inner circle. The outer edge of the circle is the edge that will be exposed in the final product of your top. You'll want to finish the edge with a serger unless you've chosen a no-fray fabric to work with. Pull your circular fabric pieces taut so that they lay straight. Do you see the ruffles now? Okay that was just for fun, now back to work. Pin all your circles together so that the inner edges align. I used 3 circles, 2 with my blue cotton and one with a taupe lace. You can use as many as you like! 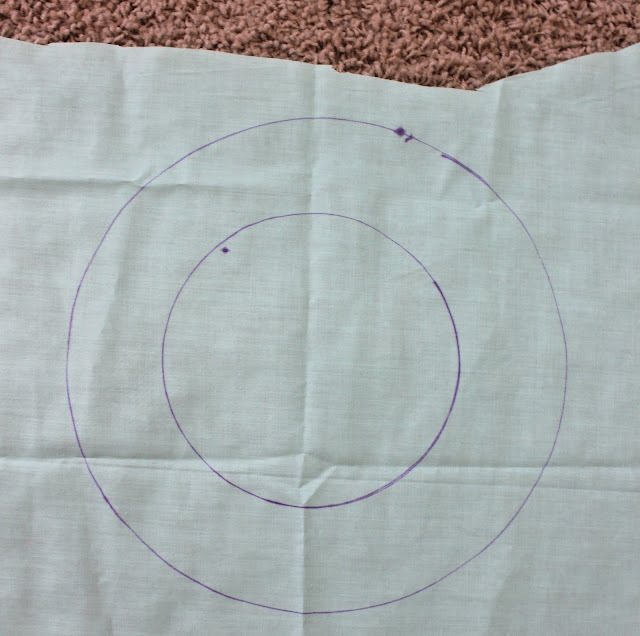 Sew or serge the circle together along the inner edge. Now for the scary part. Cut straight down your top/dress from the center of the collar to the center of the hem. I used my cutting mat to help with this. 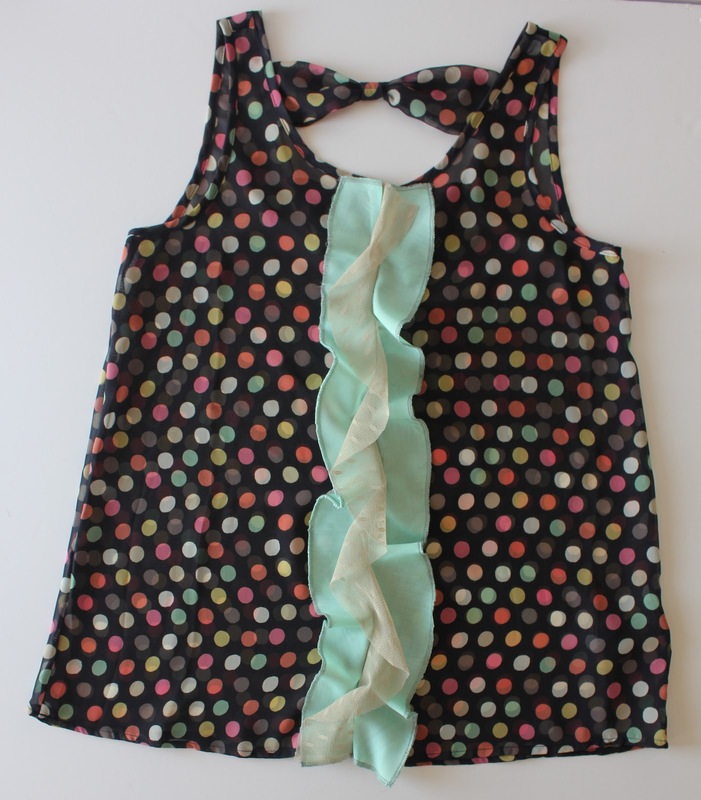 Turn your top inside out and sandwich your ruffle between the material of the top, pulling the ruffle taut as you go. Serge or sew in place. 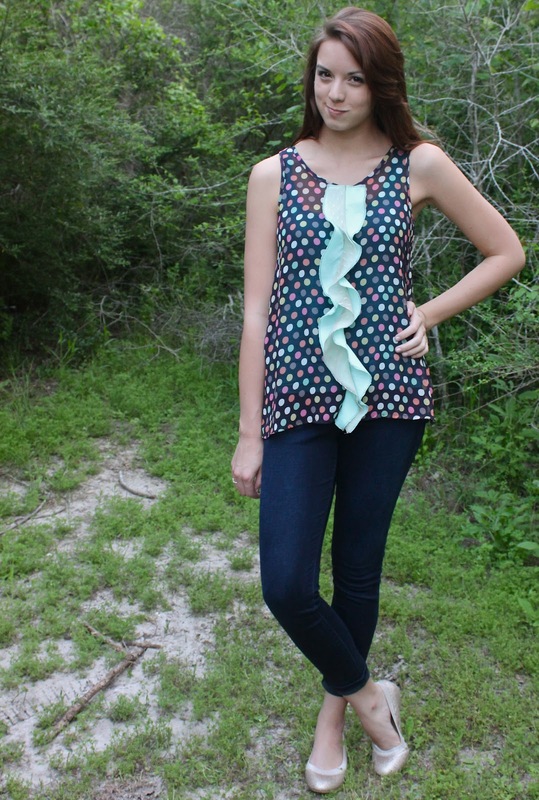 Cut off any extra material at the hem and collar. Finis the edges of the ruffle with your serger. Polka dots and ruffles, what could be better? I love that you used lids. I just had to comment and tell you that. Super cute top. This is really cute! I have never seen ruffles made this way. Thanks for posting! I would love it if you would share at Snips and Spice Sunday Slice this week. Great tutorial! Ruffles have always been a challenge for me--I'll have to pin this to use it later. You look adorable in that top! Sooo cute! :) You make it seem so easy.. lol. I'll have to try and find out!! I love the simplicity of the ruffle! I didn't realize it was so easy to do! I enjoyed reading your articles. This is truly a great read for me. I have bookmarked it and I am looking forward to reading new articles. Hello! 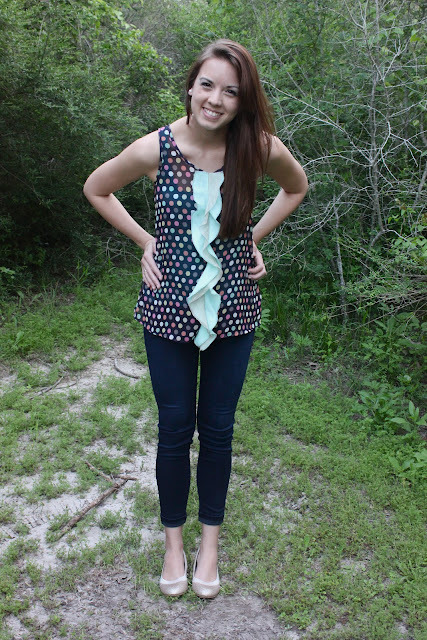 My name is Katy, and I love to sew, make, and share. Thanks for stopping by! © Sweet Verbena. All rights reserved.